Citizens Bank & Trust Company has been proudly serving Arkansas & Eastern Oklahoma since 1886. We have several locations throughout the River Valley in Crawford County with branches in Van Buren, Alma & Mountainburg. We’re in business to make our customers successful & we are honored to have your business. Citizens Bank and Trust is offering products, service and expertise through a customer-focused effort. Any success the Bank enjoys will depend upon the success of our customers. If you’re not sure of how to log into your account, how to change your password or how to enroll for online banking account, the guide below will show you how. You will be directed to the dashboard of your Citizens Bank and Trust Online Banking Account. Note: By entering your personal e-mail subject text in this field, Citizens Bank and Trust will add this text to the Password Self-Reset email, so you will know that the e-mail from us concerning your Password is legitimate and was generated by an inquiry of yours. Citizens Bank and Trust will send you a new password via email. 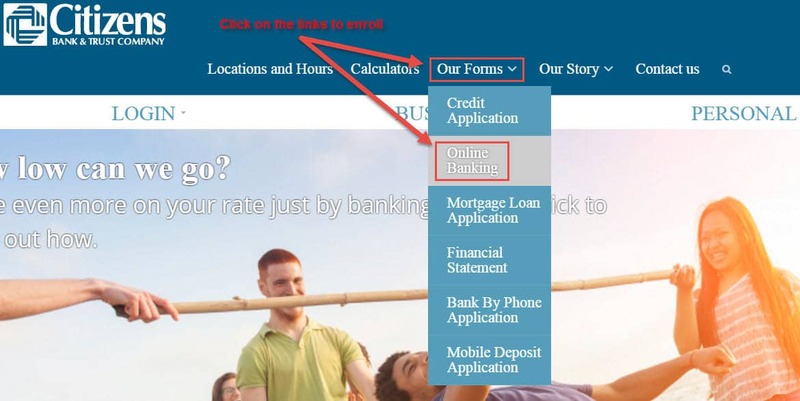 Citizens Bank and Trust allows its new customers to Signup for Online Banking service. Step 2– Download and print Online Banking Application, complete the application and sign in the signature space provided and deliver it to one of their branches or mail to Citizens Bank & Trust Company, eBanking Department, P.O. 469, Van Buren, AR 72957. If the Bank accepts your application, they will provide you with an Online / Mobile Banking ID and a temporary PIN. The first time that you access your account, you will be required to change your PIN Number. Citizens Bank and Trust and other financial institutes are closed on the same holidays.